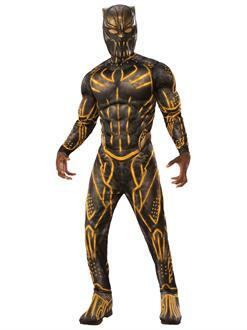 Take the Wakandan throne for yourself this Halloween when you throw on this stylish, supersized suit. The Black Panther Adult Deluxe Killmonger Battle Suit Costume will get you bulked up and kitted out for action as T'Challa's nemesis. This officially licensed Marvel set includes a full black bodysuit with sculpted chest piece and attached boot covers, as well as a matching mask. Get it quick when you order on our online store!